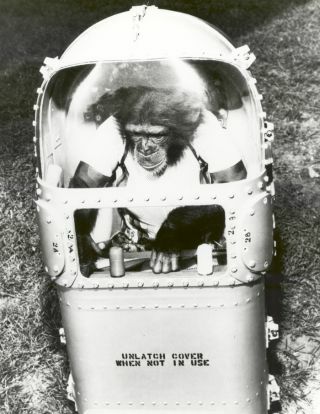 In preparation for his 1961 Mercury Redstone-2 flight, Ham checks out his life support system and couch. In this historical photo from the U.S. space agency, Ham tries out his combination couch and life support system in preparation for his flight in Mercury Redstone-2 (MR-2). The couch is plugged into the circuit that normally would supply the astronaut's full pressure suit. The MR-2 flight was one in a series of flights that led to the manned orbital flights of NASA's Project Mercury program.